This post was meant to go up last night and then Lucas got sick…again, so it has been slightly delayed. 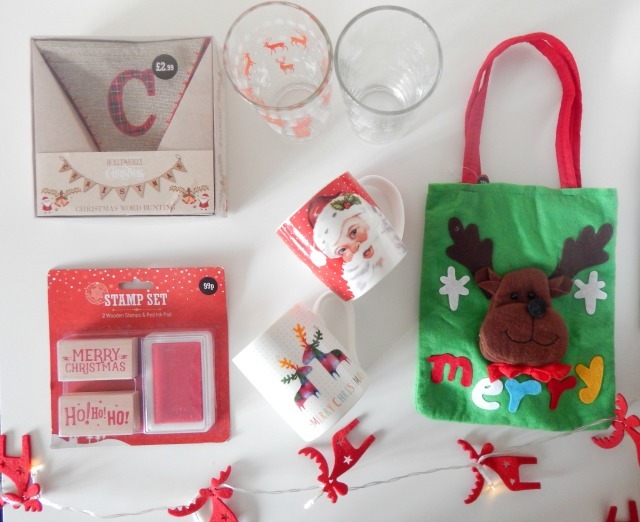 We’ve had so many bugs flying round I’m still waiting for the festive fun to start but I bought lots of fantastic Christmas bargains this month. I am definitely ready to go when everyone is feeling better! If you fancy joining in with Five Under £5 do go and have a look on Rainbeaubelle, each month there is lovely shopping inspiration from everyone. Nearly everything this month is from Home Bargains which wasn’t my intention but then everytime I’m in there I see something else to buy. It’s one of the few shops near us that is open late so I can go in the evening. I’ve had to dig all these out as I bought them a few weeks ago now, before it was really acceptable to get the decorations out. Everywhere you turn in our house there are bags full of gifts and treats, I’m just hoping I remember to find them all again come the big day! 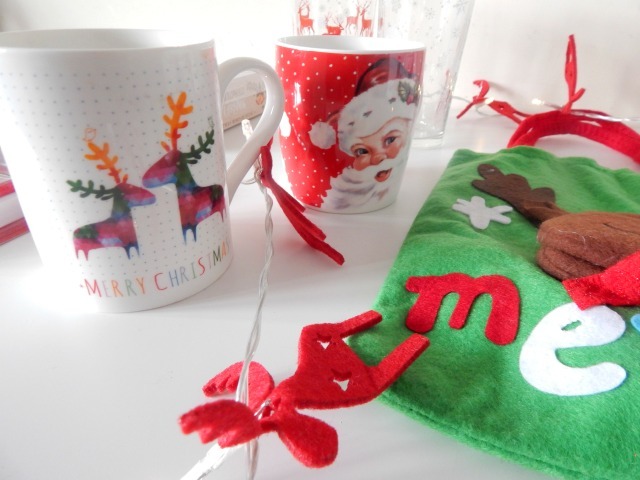 My favourite thing this month is my new Christmas mugs – the Santa one is for me and the reindeer is for my husband, he rolled his eyes when I told him I’d bought yet more mugs but it raised a smile when I showed him this one. They were 99p each and I love them. I also got a set of four Christmas design tumblers which I think were £1.99, I thought these would be nice for the boys. Weirdly, they don’t really like hot chocolate so we tend to make milkshakes and smoothies for treats. 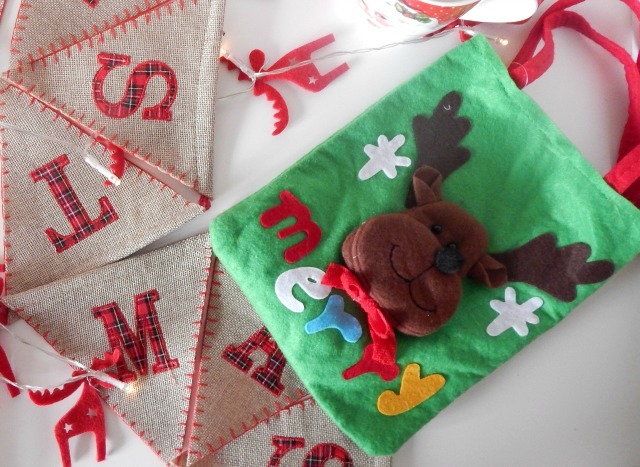 The little reindeer gift bags were 79p each, I bought quite a few as I think they’re a nice thing to have in for giving little gifts. I’m going to use them for the teacher presents – I usually pop a few treats in a bag for them so these will be perfect. They probably won’t last very long but I thought they were cute and different from the usual gift bags. 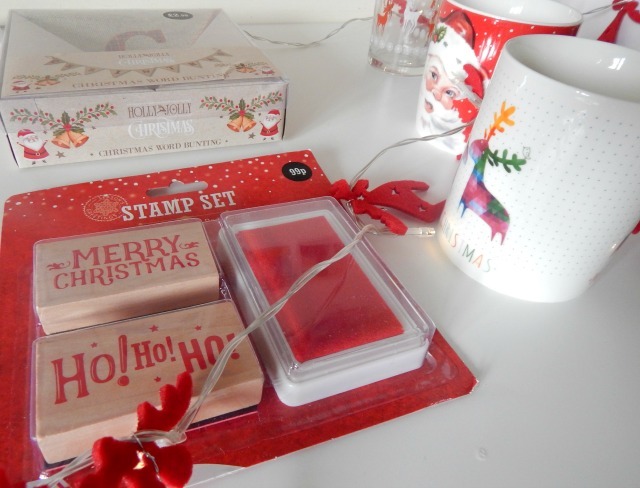 I also picked up the Christmas stamp set which was just 99p! I haven’t opened it yet so I’ve no idea how good it is but for the price I thought it was worth a try. I bought a load of brown cardboard gift tags from eBay a few years ago so these will be great for decorating them. 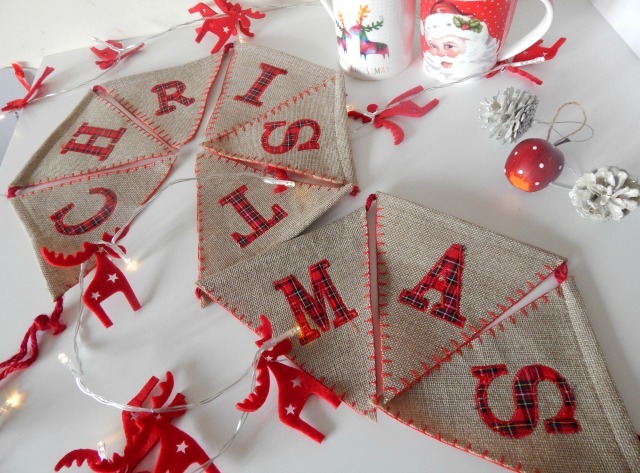 The Christmas bunting was £2.99 and I am seriously lacking in bunting so I couldn’t leave it behind. I’m still not too sure where to put it but I’ll find it a home. I know I’m technically over the five now but I have to mention the reindeer fairy lights I’ve used for decoration, they were £3.99 from Aldi. There are a few different designs and I’m sure I have them all now, they are all over the house and will probably stay up for far too long! Banned from buying any mugs unfortunately as we have far too many!! I must try to join in with this as it’s right up my street. Maybe January will be my month if I get some sale bargains! My kitchen cupboards are constantly over flowing, doesn’t seem to matter how many times I clear them out! Can’t wait for school hols!! Home Bargains is just ace isn’t it! I don’t have one near me, but we do have a B&M Bargains, which is pretty similar. I can’t go in too often otherwise I spend far too much!